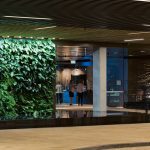 Learn about the important aesthetic, economic, physiological and environmental benefits vertical gardens provide building designers, owners, tenants, visitors – and our world. Millions of people are migrating to cities every year. By 2050, it’s predicted that 70% of the world’s population will be urban. As hectares of green make way for concrete and steel, new challenges arise. Research shows that reintroducing natural habitat and species into the urban landscapes where people live, work and play is a vital component in the remedy for a sustainable future – for everything. 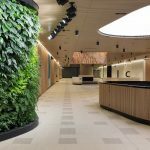 Green living wall architecture is a vital element in this transformation – and the seedbed of the Vertikal philosophy. Biophilia is humanity’s intuitive and deeply ingrained attraction to nature. It actually means ‘ love for other life forms’. It’s why almost everyone pictures a natural setting – a forest, a green field, a beach – when they want to feel calmer and more relaxed. an ability to heal faster. 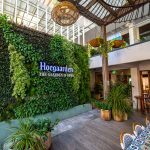 Vertical gardens will often bring together a wide range of plants. Research has shown this melange of species can have an even more potent biophilic effect. In big cities, we spend close to 90% of our lives learning, working, socialising, relaxing and sleeping inside. These air conditioned environments contain toxins such as formaldehyde, VOCs, trichloroethylene, carbon monoxide, benzene, toluene and xylene – a heady concoction for our lungs to try and filter every day. extra oxygen released from plants helps keep people awake and alert. 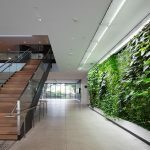 With a vertical garden, you could have hundreds of plant species matched to your environment creating safe, clean air in your building day and night. The Urban Heat Island (UHI) effect is a result of the land and atmosphere being modified to build cities. Hard inert surfaces – such as building walls – become far hotter with increasing exposure. subtle, pleasant airflow not present without vegetation. 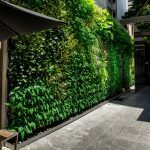 Like to know more about vertical gardens? Contact the Vertikal team today..